The Democratic Senator of New Jersey, Bob Menendez, today introduced a Resolution marking the twenty-fifth anniversary of the genocide in Rwanda, which cost the lives of over one million people. “This April we join with the people of Rwanda and the global community to solemnly commemorate the 25th Anniversary of this terrible moment in history,” said Senator Menendez in a press release available on his web site. The draft resolution does not shy way to call out the US government’s refusal to intervene in Rwanda as the genocide was unfolding. “As we commend the people and government of Rwanda in continuing to take steps toward peace, reconciliation, and accountability, we also acknowledge the tragic failure of the international community, including the United States, in providing urgent assistance in helping to prevent and stop the organized campaign and the mass killing that ensued.” Added the Democratic Senator of New Jersey. While it’s not the first time that the United States recognizes its failure to stop the 1994 Genocide against the Tutsi in Rwanda, this resolution–once voted, will be the first of its kind since the Clinton administration. Usually, the State Department would issue a low- profile and often generic statement every year, to mark the 1994 Genocide commemoration. On March 25, 1998, President Bill Clinton expressed regret for failing to halt genocide in Rwanda, saying that he didn’t “fully appreciate the depth and the speed with which [Rwandans] were being engulfed by this unimaginable terror.” It turned out to be a blatant lie. Now we know how much the Clinton administration knew. Classified papers show Clinton was aware of ‘final solution’ to eliminate all the Tutsi of Rwanda. Truth is that the United State simply chose to ignore Rwanda. The Menendez resolution once adopted, will be a small positive step forward. 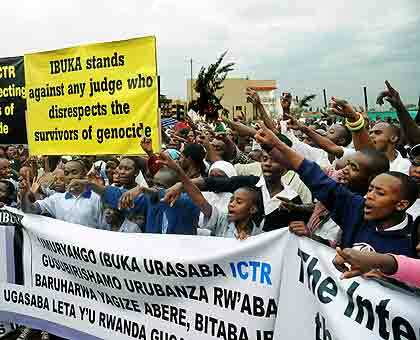 There is so much however, the US Senate and Government can do to mend its failure to abide by the international law in refusing to intervene in Rwanda. Contributing to the establishment of the International Trust Fund for the survivors is one of the most comprehensive ways the US can explore to bring closure to its failure with dignity. On a pragmatic level, the Senate should among others, make it mandatory to teach the 1994 genocide against the Tutsi in all secondary schools and erect a major genocide memorial in the USA, to educate the young generation about the world’s fasted genocide. Ends.